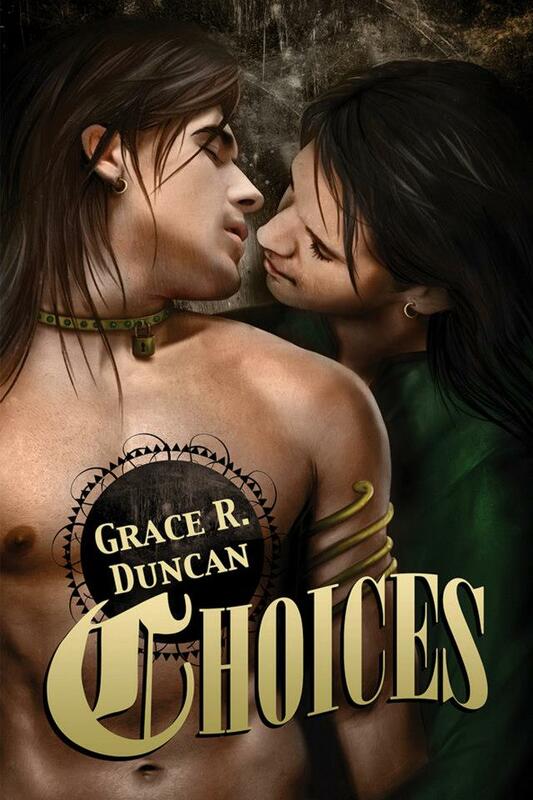 Today, I have Grace Duncan with me, as part of her blog hop tour for her new release Choices, from Dreamspinner Press. One of the things that impressed me about her explanation of the research that goes into her stories is the fact that even if some sort of fact-finding hunt fails to make it into the body of the story itself, it still goes to world-building. That’s what creates depth and lends the voice of authenticity to a story! But let me let Grace tell you in her own words! Grace, the floor is yours! It never ceases to amaze me, the amount of research that goes into a story. I sat down and went through my catalog of both fanfiction and original pieces and there wasn’t a single story that I saw that I didn’t research at least something for. A quick glance at my adultfanfiction.net profile (the most complete collection of stories, though it still doesn’t have everything) shows that I’ve put some forty-one separate stories up there and as I scanned through the list, I can remember something I’ve researched for each one. Mind you for some – like my novel Choices – I have researched quite a bit more than one thing for it. Some stories require more research than others, obviously. For instance, Science Fiction— a genre I hope to write in someday —would, in my estimation, require a lot if the science were to be believable. Historical fiction is also like that, if the writer wants to make sure that the world is at least reasonably historically accurate. We all will still take some (even small) liberties with the worlds we write because some things just aren’t feasible within our stories. However, the research is still a must, no matter what liberties we take and the list of different items to look into can be quite long. For Choices, in fact, the list of things I’ve researched seems endless. I remember looking into everything from food to clothing to transportation (horses, royal conveyances, and travel time) . I spent more time than was likely necessary researching deserts, desert peoples and the climate of those parts of the world. I have a folder on my computer with countless pictures of palaces, horses, food, you name it. I also researched technology. In fact, at one point, I was about to write something on the passage of time and it occurred to me that during the time period in question, my characters might not actually know what a “few minutes” felt like… since “minutes” might not have even been a concept to them. Choices takes place in the fictitious country of Neyem in the late 11th century. Even though the country is made up by me (and, in fact, the entire map is), I still wanted most things to be as accurate as I could make them for a late 11th century Middle Eastern-type of nation. So, to the Internet! What was the Middle East like in 1095 AD? What technologies – specifically time-keeping devices – would have been around? Well, fewer – and yet more – than one might think. When we think of clocks in this day, we often think of our small watches, probably our cell phones or some other digital device. Those of us who remember big hair in high school will undoubtedly first think of classic clock faces and their internal gear workings. But the earliest spring- and gear-driven clocks were actually only referenced in the 15th Century. One such instance is the chamber clock that the Duke of Burgundy was gifted with in the early 1400’s. Okay, well then, those were out, right? If we’re in 1095, obviously we can’t use spring-gear-driven clocks. So what did they use? Surely they kept time, right? Most definitely. 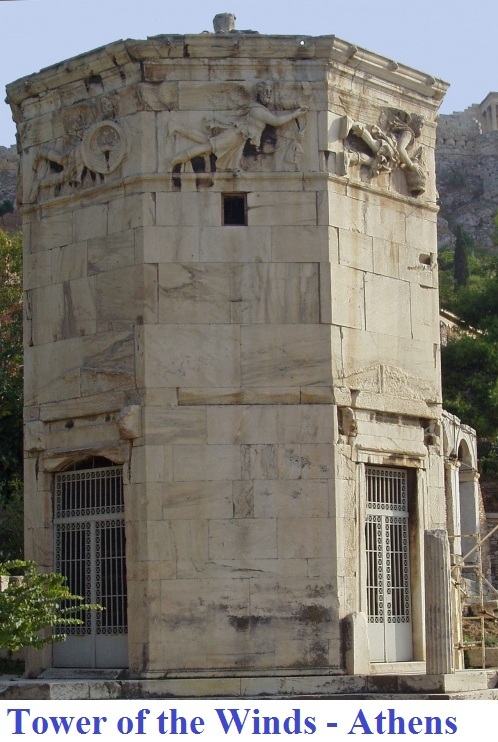 There were clocks (actually known as horologia – a Greek word meaning ‘hour’ and ‘to tell’) possibly as old as the 2nd century BC (though its exact date of construction seems to be contested). 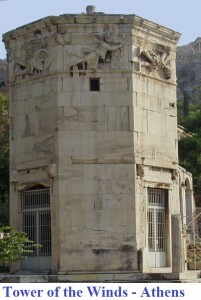 Called the Tower of the Winds, it was built on the agora in Athens and has a quite a long history of changing hands and being buried and later dug up. But as famous as the Tower of the Winds was, it was quite unusual, which is undoubtedly what lent to its fame. So it was also quite rare. Not something a small-ish Middle Eastern country was likely to build. So, then, what did the more common royals use? Believe it or not, something that is occasionally still in use today and yet dates back as far as the 16th century BC (and possibly even earlier, though with no written records, we can’t know for sure). Yet again, when they first started to be used is in contention (like most of history, it seems), but they are all sure that the water clocks were first used at least by the 4th century BC in China. As one of Neyem’s neighbors is based (somewhat not-so-loosely) on China, it would make sense that they would have these and possibly many. But what surprised me quite a bit was to find out that it was actually an Arab inventor & scholar (among other things, basically an earlier, Arab version of Leonardo daVinci), al-Jaziri, who was instrumental in advancing the water clock. He lived about 40 years after Choices takes place, but remember those liberties that we authors take? Well, I figured it was close enough. So, what are water clocks? They are, essentially, a measured movement of water from one place to another. As the water moves, the person looking at the clock knows – again approximately – how much time has passed. 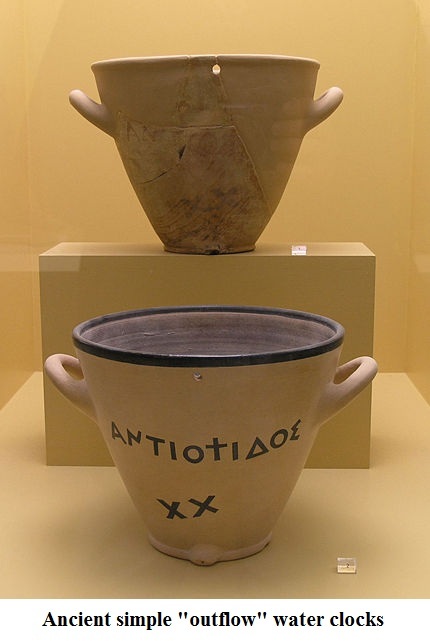 The simplest water clocks were two pots – one higher than the other. The upper pot had a hole in it and the water flowed out into the lower pot. 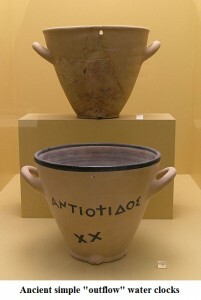 The level of the water in each of the two pots would indicate the general time. The design drastically improved as time went on and, in fact, it was al-Jaziri who was very instrumental in their change, becoming much more intricate with large gears, moving parts and more. When I started reading about them, I realized quickly that unless Mukesh paid to commission one or he was gifted with one in an effort to impress him, he wasn’t likely to see one built. (Mind you, Bathasar might just inspire something like that. Mukesh… not so much.) So they would have them, though they would likely be more simplistic. I didn’t actually use a water clock specifically in Choices. Instead, I simply assumed that would be the time-keeping method of preference. Some countries had measured burning incense that I could see the Neyemen people using along with other time keeping devices like measured candles. In the end, I decided it wasn’t worth making a point of. Teman would have known how to tell the time by the sun and used that. Bathasar, as a royal, would likely not have cared what time it was, specifically. And the situation I was concerned with – Teman on the floor waiting for his turn to be presented – would have felt infinitely longer than any actual time passage, anyway. It’s still interesting to see what all is researched in the name of writing fiction. I know that I often research things that I end up leaving out entirely. And, in fact, I even researched medieval toilet options and decided I did not think people wanted to read about it! Historical fiction, I think, is worse than most other genres because there is a need for accuracy. It’s often under the microscope as many people like to read history and want it to be as close to real as possible. This is, undoubtedly, why so many authors turn to alternate worlds so that they can have some freedom in what they do. I’m lucky in that I love research. Most often, I get lost in it, clicking from one place to another. It’s something I find myself having to rein in quite a bit or I will never get my book written! I do hope, however, that it lends a fullness and realistic quality to Choices. Please note: Yes, I used Wikipedia in my links above. While I was researching, however, I can assure you I read many, many more pages. I would never actually depend on Wikipedia for all of my research. It’s a good starting point, though and there are many great links if the above really interests you. Thank you very much to Sarah for hosting me today! Please don’t forget to leave a comment. Ask me anything, tell me what about historical fiction you like to read or even just say hi! You’ll be entered to win a swag back full of goodies from Choices! Choices is now available on Dreamspinner Press! This entry was posted in Uncategorized and tagged announcements, Dreamspinner Press, guest blog, research, Sarah Madison, upcoming release, writing by Sarah Madison. Bookmark the permalink. Fascinating post, Grace! I enjoyed learning more about the history of timekeeping, and about your research process (I do remember you put in many, many hours)! I really am glad you put so much research into the world for Choices… even if all of your research didn’t make it into being shown out in the open in the book, the building of the world in your head must really have helped. Ah, cool that you’re working on historical fiction now, as well! When I tried my hand at it, I shamefully did NO research – but to my defense, I was only twelve years old. And yes, dedication, and maybe some procrastination in there too, as Grace said below, but hey, learning is fun! The funny thing is, I didn’t set out to write a historical novel this time. I wanted to include a dream sequence in which one of the main characters sees the other as a WWII flying ace. I wanted the details to be accurate, though, and the next thing I knew, I’d spent over a month researching the Battle of Britain, and the dream sequence was now a major part of the story. *giggles* sounds like it’s been a lot of fun, and like something I’d like to read! Thank you so much for stopping to comment!! I do hope it really did come through in the story and anyone who reads it can agree. Sarah, I’m not sure if that’s a level of dedication or procrastination (or a combination of both…). Glad you think it’s the positive one, either way. LOL! I forgot to mention, I remember you doing all the toilet research, and am glad that none of it made its way into the book, haha. As nice as it is to make things realistic, people usually don’t want to read about the characters having to take bathroom breaks. And like I said above, even if it was sometimes procrastination, at least you were still learning in the process! Such insight! Thanks for sharing, Grace. And thanks for hosting her, Sarah. One thing I picked up on in the book was the “names” for meals. Dinner, lunch, breakfast were not used. It was mid-day and evening meal, etc. Incredible to see such detail. Some authors don’t care to go into that much historical accuracy. I’m going to assume that what we calk mealtimes was very different back then and in that part of the world, fiction or not. There was other stuff too but for some reason that stands out to me and I remember thinking about it several times while reading.